Home/Gibson Tru Body/Small but Stylish!! Gibson Tru-Body are known for our larger tippers and service bodies, but we also do the small things well. Small and stylish this 1 Tonne tray on an Isuzu D Max looks the part. Painted metallic red to match the cab, has a pipe headboard, dropsides and tailgate, and a steel c/plate floor. Looks stylish but is also ready for work. Remember Gibson Tru-Body next time for your small body needs!!! 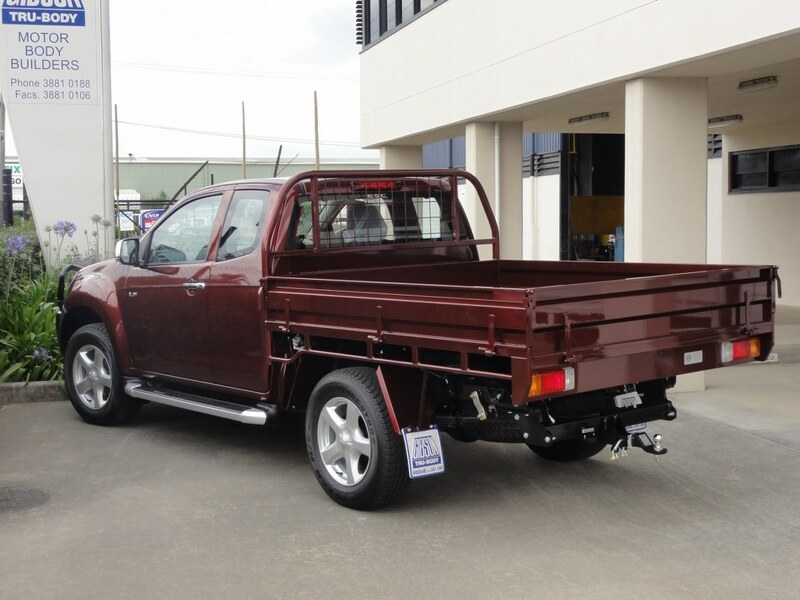 Gibson Tru-Body specialises in the manufacture of steel framed light commercial truck bodies and associated metal fabricated products to all motor truck dealers in Queensland and Northern New South Wales. Our products and services include Tipping Bodies; Vans; Service Bodies & Specialised Bodies; 1 Tonne Trays & Medium Trays; Tailgate Loaders; Cranes; Accessories – Towbars, Ute Lids & Toolboxes; Road Rail; Trailers; Tru-Step Commuter; Roadside Maintenance & Mine Vehicles. For Bookings and enquiries, please contact us on (07) 3881 0188 or via email sales@gibsontrubody.com.au.